FIV (Feline Immunodeficiency Virus) is a feline only, slow-acting virus. Many shelters (both “Kill” and “No-Kill”) routinely “euthanize” all cats who test positive for FIV antibodies. This is so wrong! * FIV simply means a cat’s immune system MAY be compromised somewhere down the road. * FIV is a lentivirus, which is very slow acting and usually won’t affect many years if ever. 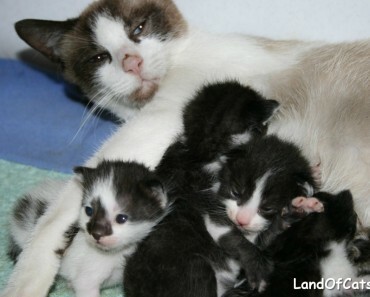 * Most FIV cats live long, healthy, normal lives with no symptoms at all. 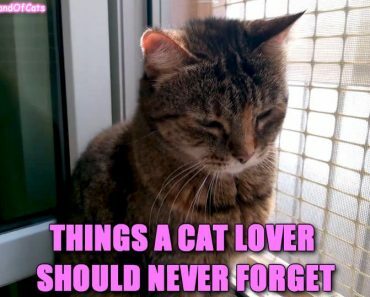 * Most FIV cats die of the same old-age diseases that kill Non-FIV cats. 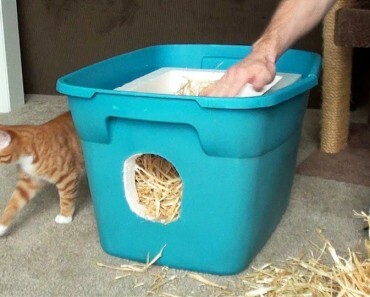 * FIV cats need the exact same good care you give to ANY cat. * FIV is not easily passed between cats and cannot be spread casually. It is NOT passed by sharing of food or water dishes, grooming each other, litter boxes, mock fighting, scratches, nor even sneezes. * A neutered FIV cat, in a home, is extremely unlikely to infect other cats, if properly introduced. * FIV and Non-FIV cats can live together in the same household. Myth 1: The FIV test is reliable. Fact: 20% of “positive results” are test errors. The error rate for kittens is even higher. Thousands of cats and kittens are killed daily because of test errors! Myth 2: The FIV test shows the existence of the FIV virus. Fact: It measures nothing but antibodies, microscopic organisms that fight the virus. Myth 3: Kittens that test positive for FIV will always test positive for FIV. 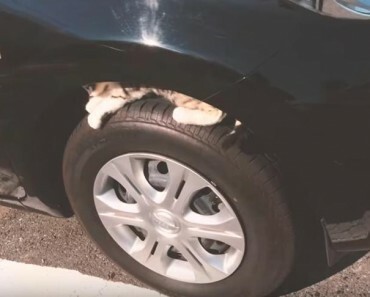 Fact: “Infected mothers rarely, if ever, pass the infection to their kittens,” according to Dr. Niels C. Peterson, the first to isolate FIV in 1986 and Director, Center for Companion Animal Health, UCD avis School of Veterinary Medicine. “Kittens should be re-tested at 6 to 8 months as most will then test negative because the maternal antibodies will have seroreverted.” -Korel Shelter Medicine Program, UC Davis Veterinary Medicine. Myth 4: Cats who have the virus inevitably develop the disease and die from it. 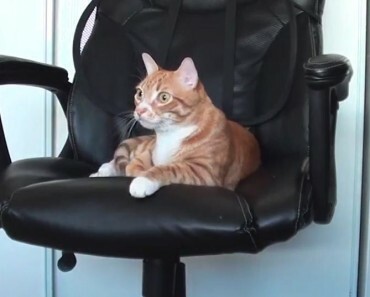 Fact: 90% of cats who actually have the actual FIV virus “will lead completely normal lives.” And die from the same causes that any other cat might die from. Myth 5: FIV+ cats will lead short, miserable lives. Fact: FIV+ cats can and DO live long, healthy lives, if given a chance. Most live as long as their indoor counter parts and much longer than outdoor cats. Many live well into old age without symptoms. Myth 6: The FIV virus is a serious threat to other animals be-cause it can be transmitted by casual contact. Fact: Modern medical research as well as mounting empirical evidence, indicates that transmission requires serious physical interaction. “Deep bite wounds are, by far, the primary mode of the virus’ transmission.”-Julie Levy, DVM, PhD, DACVIM Director, Maddie’s Shelter Medicine Program. Fact: The virus can only live a few seconds outside the body, so sharing food and water bowls is not an issue. “The primary mode of transmission is through bite wounds. Casual, non-aggressive contact does not appear to be an efficient route of spreading FIV; as a result,cats in households with stable social structures where housemates do not fight are at little risk for acquiring FIV infections.”-Cornell University. Here you can download the FIV Myths Flyer PDF! 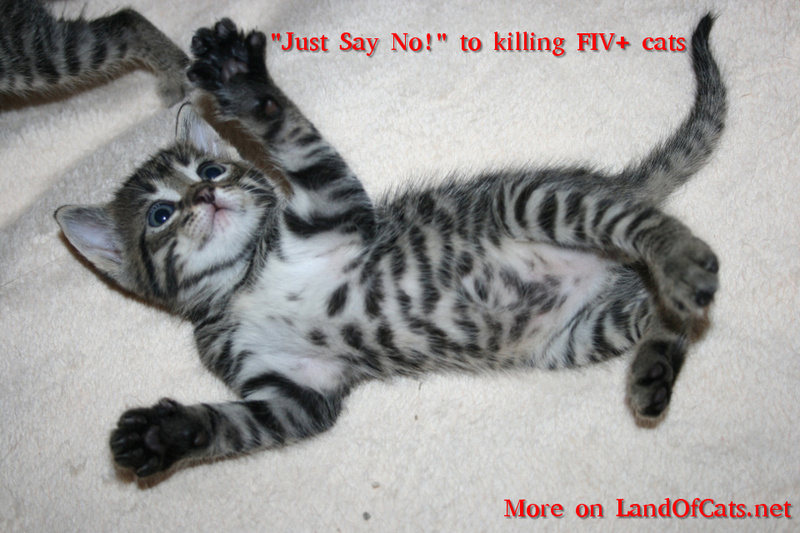 Please SHARE to raise awareness: “Just Say No!” to killing FIV+ (Feline Immunodeficiency Virus) cats and ADOPT one if you can!